This is the exclusive selection of Suncity apartments in Malaga for all types of travelers, well either for business, family trips, groups of friends or couples. We have available different types of apartments. The apartments are located in the historic centre of the city or very close to it, so you’ll can live intensely the activity of the city: business, gastronomic, cultural and leisure. Those apartments that are not located in the historic centre are selected so that you can access to it in a short time, walking or in public transport, like this you’ll enjoy a more peaceful environment, far away from the noise of the centre. Click on the apartment that more you like, check the dates of your travel to confirm the availability and you can make your booking online completely safe. Central studio in Calle Peña, equipped with everything you need for a comfortable stay in the capital of the Costa del Sol. Suncity Ismo Arquitectura is a loft with WIFI, air conditioning and capacity for 2 people. 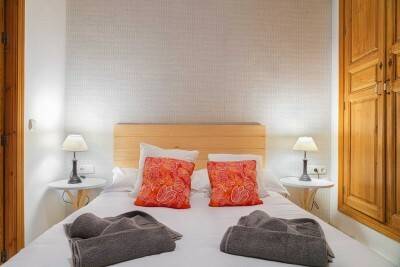 Located in the center of Malaga just 260 meters from the Plaza de la Merced and the Museum of the Birthplace of Picasso. It is a bright loft with flat TV, kitchen and a bathroom. 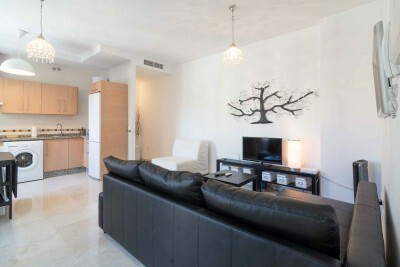 Suncity Penthouse Gigantes is a spacious and bright 1 bedroom apartment in the center of Malaga. It has capacity up to 3 people. It has a large living room and kitchen, bathroom with tub and a bedroom with double bed. Sun City Gigantes Penthouse is located just 300 meters from the Carmen Thyssen Museum and the shopping streets of downtown Malaga. Suncity flat Salitre are one bedroom apartments with living-kitchen, bright and functional in an area of Malaga ideal for a holiday that combines shopping and visiting museums. María Zambrano station is just 400 meters away, where the Vialia shopping center is also located. The Contemporary Art Center (CAC) is 300 meters from the apartments on the way to Soho and the Plaza de la Marina, where Calle Larios begins. 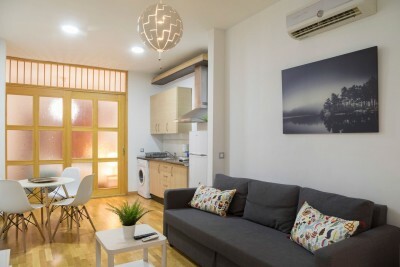 Suncity Refino Estudio is a modern studio located in a neighborhood of the city center, very close to the Plaza de la Merced, a few minutes walk from the entertainment area and restaurants downtown, the main museum and tourist attractions from the city. 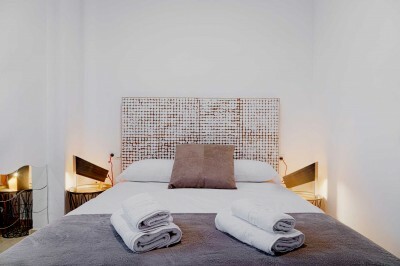 Suncity Loft Especerias are two apartments refurbished, combining traditional aspects of the buildings of the center of Malaga with a modern and luminous decoration. With capacity up to four people, in the Centre of Malaga, on the same street that gives it name. At a very few meters from Marqués de Larios Street and the Square of Constitution. 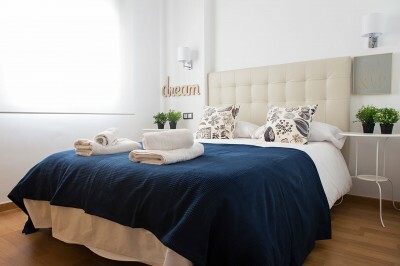 Suncity Refino Cervantes are one-bedroom apartments with a bright and functional double bed in an area of Malaga ideal for a holiday that combines shopping and visiting museums. The kitchen is integrated and equipped with everything you need to cook and keep your food (appliances and utensils). A dining area and a spacious living room with a comfortable sofa bed and television. Good natural lighting and modern and functional decoration. 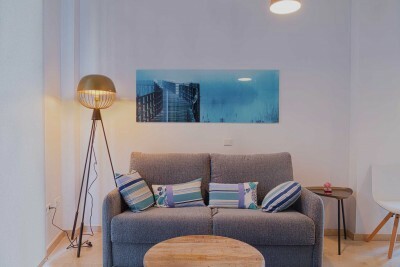 Suncity Flat Soho is a comfortable apartment in the area Soho of Malaga, located just at 500 meters from the street Larios and 600 meters from the Cathedral of Malaga. Capacity maximum for four persons. 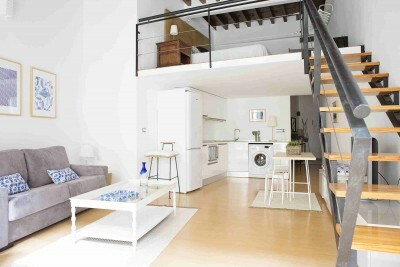 Loft newly renovated with capacity up to four people, in full Center of Malaga, area Carretería and street Alamos. Suncity Refino Oriental are a one bedroom apartments with a bright and functional double bed in an area of Malaga ideal for a holiday that combines shopping and visiting museums. The kitchen is integrated and equipped with everything you need to cook and keep your food (appliances and utensils). A dining area and a spacious living room with a comfortable sofa bed and television. Good natural lighting and modern and functional decoration. 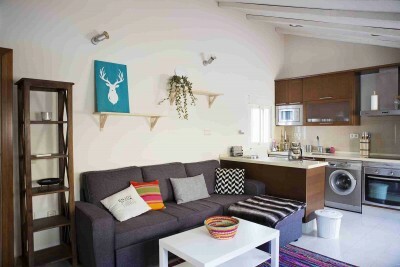 Suncity Shed 1 bedroom is a fantastic apartment with WIFI and can accommodate up to four people. 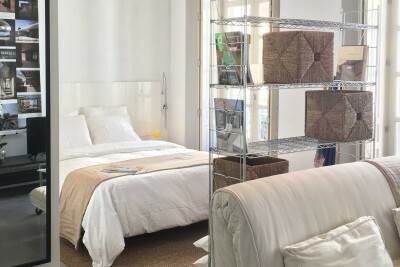 Located in the center of Malaga just 130 meters from the Plaza de la Merced and the Museum of the Birthplace of Picasso. 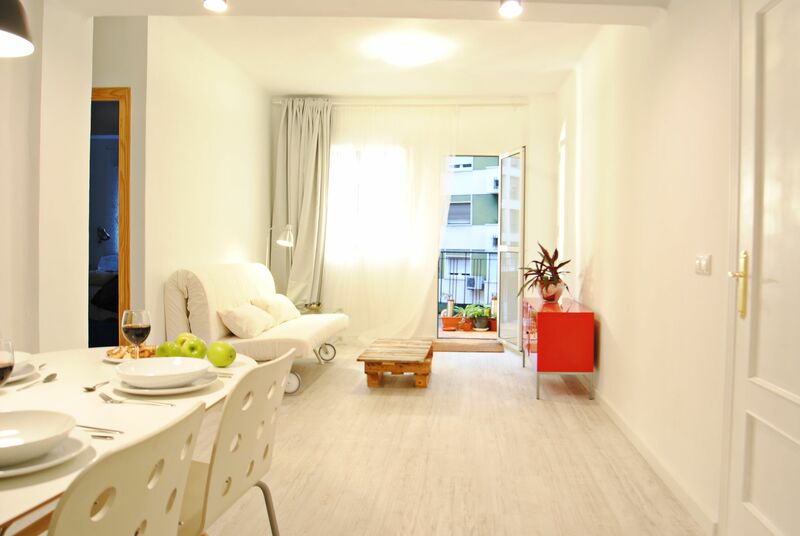 Suncity Flat Delicias is a one bedroom apartment recently renovated in the center of Malaga, with capacity for up to 4 people. Decorated in a functional way, modern and colorful style with pop details. It is very bright, with a balcony and large windows to the outside. It has a large integrated kitchen, fully equipped with kitchenware and appliances: washing machine, ceramic hob, oven, microwave, ... Living room with double sofa bed and LED TV screen. Suncity Plaza Apartments is a building of tourist apartments. It is a 1 bedroom apartment with capacity for 4 people. It is a beautiful restored building whose origin is a former tenement, the apartments arranged around an open air courtyard. The apartments have functional décor to make your stay as comfortable as possible. Ideal both for short as for long stay. The Square de la Merced and Picasso's birth house Museum are just at 600 meters from the apartments. Suncity Pozos Dulces 1 bedroom is an apartment with 1 bedroom with bright and functional double bed in an area of Malaga ideal for a holiday that combines shopping and visiting museums. The kitchen is integrated and equipped with everything you need to cook and keep your food (appliances and utensils). A dining area and a spacious living room with a comfortable sofa bed and television. Good natural lighting and modern and functional decoration. 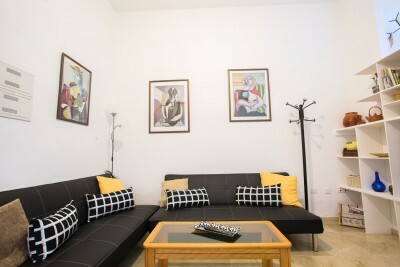 Central apartment is located about 260 metres from the Cervantes Theatre, 350 meters from the Museum Casa Natal de Picasso, about 400 meters from the Square de la Merced. Suncity Flat Cánovas is a newly renovated downtown apartment, with one bedroom and capacity for up to four people. With large windows to the outside, it is very bright and is decorated in a modern and functional style with "naif" details. The bedroom has a double bed and a built-in wardrobe. 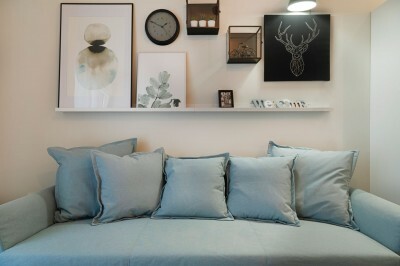 The living room is spacious and has two comfortable sofas, one of which converts into a double bed. Led television and dining table for four people. Apartments with two bedrooms, with balcony, in the surroundings of El Corte Inglés, at one kilometer from the Square of Constitution. Maximum capacity of six persons. 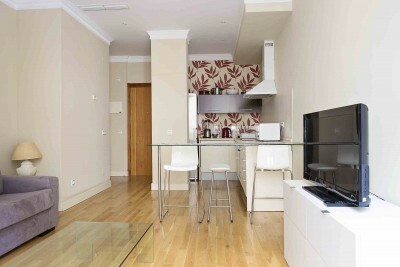 Beautiful apartment located in the historic center 2 minutes walk from Calle Larios. Very bright living room and large outdoor terrace. Located in an environment of great commercial, gastronomic, and cultural activity. 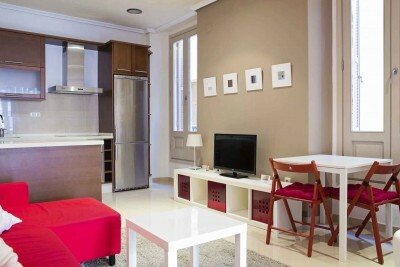 Loft with capacity for 4 persons, in the Centre of Malaga, in the area of the Square of Merced. 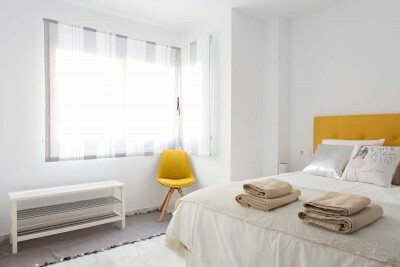 Suncity Pozos Dulces are lofts with a bright and functional double bed in an area of Málaga ideal for vacations that combine shopping and visits to museums. The kitchen is integrated and equipped with everything you need to cook and keep your food (appliances and utensils). A dining area and a spacious living room with a comfortable sofa bed and television. Good natural lighting and modern and functional decoration. 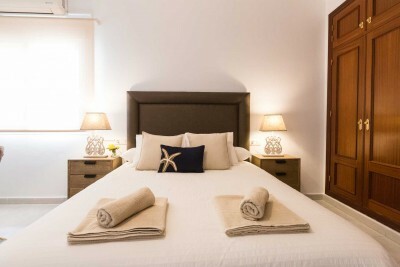 Suncity Flat Refino are one-bedroom apartments with a bright and functional double bed in an area of Malaga ideal for holidays that combine shopping and visiting museums. The kitchen is integrated and equipped with everything you need to cook and keep your food (appliances and utensils). A dining area and a spacious living room with a comfortable sofa bed and television. Good natural lighting and modern and functional decoration. 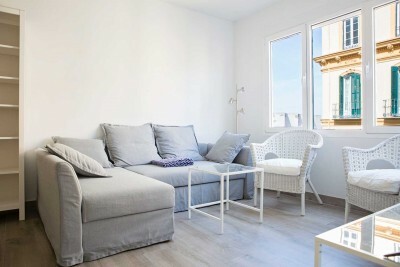 Tourist apartments with one bedroom, with a lot of natural light, two of them with balcony overlooking at very animated square and another is a loft. 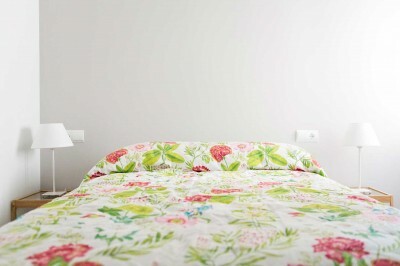 Situated in the Centre of Malaga, with capacity for four or five persons. Suncity Victoria 10 B is a newly renovated downtown apartment with capacity for five people. Very bright and comfortable, it is decorated in a contemporary and functional style. It is located in the center of Malaga, right next to the Plaza de la Merced. Suncity Cobertizo Segundo is a two bedroom apartment with WIFI, air conditioning and capacity for five people. It is located in the center of Malaga just 130 meters from the Plaza de la Merced and the Museum of the Birthplace of Picasso. 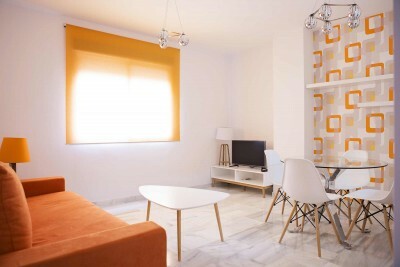 Suncity Gigantes Bajo is a spacious and bright 1 bedroom apartment in the center of Málaga. It has capacity up to 5 people. It has a large living room and kitchen, bathroom with tub and a bedroom with double bed. Sun City Gigantes Bajo is located just 300 meters from the Carmen Thyssen Museum and the shopping streets of downtown Málaga. One bedroom apartment, spacious and bright in the Centre of Malaga, in the area of Carreterias, with capacity up to five persons. 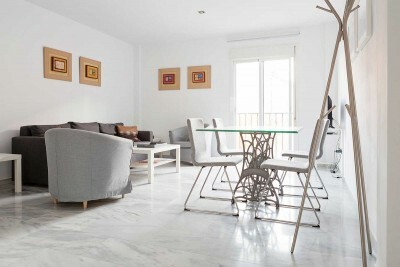 Suncity Gigantes Duplex is a spacious and bright 2 bedroom apartment in the center of Malaga. It has capacity up to 5 people. It has a large living room with sofa bed, kitchen, bathroom, a bedroom with double bed and a bedroom with single bed. Sun City Gigantes Dúplex is located just 300 meters from the Carmen Thyssen Museum and the shopping streets of downtown Málaga. Suncity Alta Flat is a spacious and bright two bedroom apartment located in the center of Malaga, 5 minutes walk from the Plaza de la Merced. 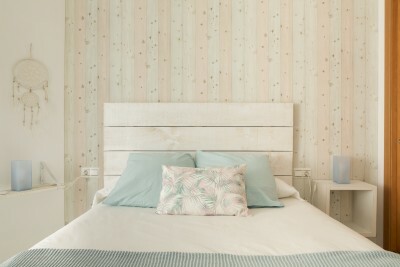 Suncity Guadiaro Apartment is a spacious and bright 2 bedroom apartment in the center of Malaga. It has capacity up to 5 people. It has a large living room with sofa bed, kitchen, bathroom, a bedroom with double bed and a bedroom with single bed. Suncity Guadiaro Apartment is located just 200 meters from the Picasso Malaga museum and the shopping streets of the center of Malaga. 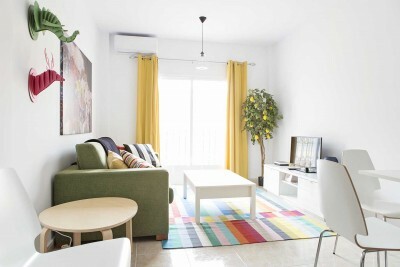 Suncity Flat Gigantes 8 is a spacious and bright 2 bedroom apartment in the center of Malaga. It has capacity up to 5 people. It has a large living room with sofa bed, kitchen, bathroom, a bedroom with double bed and a bedroom with single bed. Sun City Flat Gigantes 8 is located just 300 meters from the Carmen Thyssen museum and the shopping streets of downtown Málaga. Suncity Flat Salitre II counts with two apartments of two bedrooms, with capacity maximum for 6 persons each one. They are decorated in a modern and welcoming style. They are situated at 200 meters from the train station and 400 meters from the bus station. Suncity Victoria 10 A is a newly renovated downtown apartment with capacity for six people. 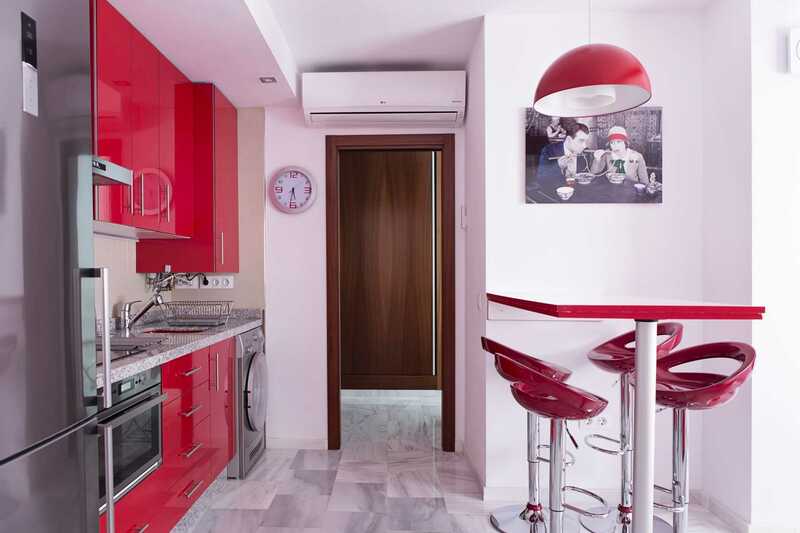 Very bright and comfortable, it is decorated in a contemporary and functional style. It is located in the center of Malaga, right next to the Plaza de la Merced. Suncity Plaza Apartments is a building of tourist apartments. It is a 2 bedrooms apartment with capacity for 6 people. In this case, it is a 2-bedroom apartment with a capacity of 6 people in a beautiful building of roofs of gable roofs, traditional, newly renovated and arranged around a patio. 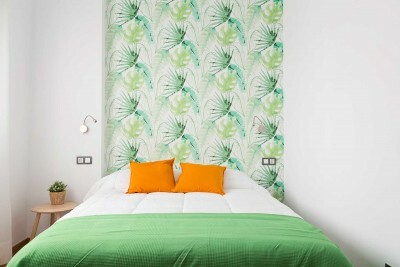 The apartments have a functional decoration to make your stay as comfortable as possible. Ideal for both short and long stay. The Plaza de la Merced and the Museum of the Casa Natal de Picasso are just 600 meters from the apartments. Suncity Plaza Apartments is a building of tourist apartments. It is a 2 bedrooms apartment with capacity for 7 people. It is a beautiful restored building whose origin is a former tenement, the apartments arranged around an open air courtyard. The apartments have functional décor to make your stay as comfortable as possible. Ideal both for short as for long stay. The Square de la Merced and Picasso's birth house Museum are just at 600 meters from the apartments. Suncity Plaza Apartments is a building of tourist apartments. It is a 3 bedrooms apartment with capacity for 8 people. It is a beautiful restored building whose origin is a former tenement, the apartments arranged around an open air courtyard. The apartments have functional décor to make your stay as comfortable as possible. Ideal both for short as for long stay. The Square de la Merced and Picasso's birth house Museum are just at 600 meters from the apartments. Rent apartments in Malaga. 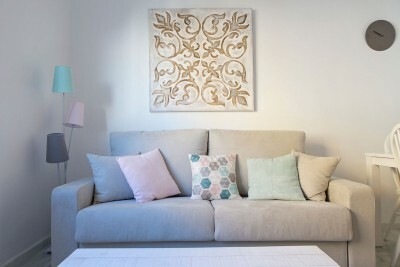 Apartments in Malaga to rent in short and long stays in the center of Malaga. Saturday: 9:30 am. – 1:30 pm.